Biopsy o the tonsil in variant CJD. 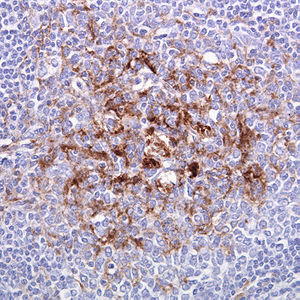 Prion protein immunostainin. Creutzfeldt–Jakob disease (/ˈkrɔɪtsfɛlt ˈjɑːkoʊb/ KROITS-felt YAH-kohb) or CJD is a degenerative neurological disease that is incurable an invariably fatal. CJD is at times cried a human form o mad cow disease (bovine spongiform encephalopathy or BSE). ↑ 2.0 2.1 2.2 2.3 2.4 2.5 2.6 2.7 2.8 2.9 "Creutzfeldt-Jakob Disease Fact Sheet | National Institute of Neurological Disorders and Stroke". NINDS. March 2003. Archived frae the oreeginal on 4 July 2017. Retrieved 16 July 2017. ↑ "CJD (Creutzfeldt–Jakob Disease, Classic)". Centers for Disease Control and Prevention. 2008-02-26. Retrieved 2009-06-20. This page wis last eeditit on 15 Februar 2018, at 21:45.